When it comes to screen adaptions of famous musicals, one must be precautious. Sure, we have been inundated with recent big scale musical adaptions, which have been definite successes, most notably Tom Hooper’s noble efforts with Les Misérables. Generally speaking, the intricacies of the lyrics and the booming nature of the score can be lost due to the underwhelming comparison of people singing on screen to the thrill of them singing in perfect harmony only a few feet away from you! 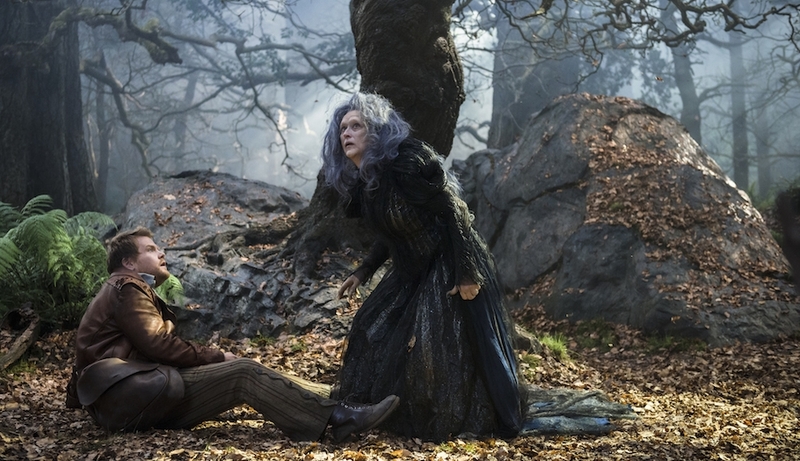 This is many ways is where Into the Woods is a triumph. The loving attention to detail to the orchestrations and the sensible direction shine through and make this a thoroughly enjoyable watch. The story begins in textbook fairytale fashion. We are introduced to a rouges gallery of classic characters such as Little Red Riding Hood, Cinderella, Rapunzel, the list goes on and on. Each of the central characters has their own reason to enter the woods, be it to go to ‘grandmothers house’ or the sell their cherished cow. The screenplay, written by Broadway virtuoso James Lapine who wrote the original book, is an ingenious combination of these classic stories that filled our childhoods and subtly introduces adult themes to what are inherently innocent tales. Be it the sexualisation of the big bad wolf’s relationship to Little Red Riding Hood or the concept of infertility and adultery brought out through the story of the baker and his wife, there is no shying away from the more mature concepts that were rampant in the stage musical. The music and lyrics, written and composed by Broadway legend Stephen Sondheim, are what truly brings this movie to life. The sharp, exquisitely executed score drapes over the movie like a silk cloth and adds colours to the movie that no image ever could. One of the films true strengths lies in the tastefully adapted orchestrations that pack the same emotional punch that the stage show exemplified in its original run. The vocal talents on display blend perfectly with the adapted score and no note or lyric feels wasted throughout the whole 124 minute run time. However, the singing ability of the actors is a veritable mixed bag. Meryl Streep’s performance as the witch showcases her strong booming alto while also demonstrating her wonderful acting ability. Her delicacy with handling songs such as ‘Stay with me’ and ‘children will listen’ is superbly juxtaposed by the powerful belt that she exhibits in songs such as ‘Last midnight’. The rest of the cast is not always as successful. Daniel Huttlestone as Jack tries his best with the show stopping number ‘Giant’s in the sky’, but his boyish tenor seems unsure at points and his naïve cockney brogue can be underwhelming. Despite these problems, overall he is inoffensive and balances well opposite the likes of James Corden and Emily Blunt who form an excellent double act throughout the film showing off some wonderful chemistry in their parts as the baker and his wife. Other performances of note include Chris Pine and Billy Magnussen who soar as the buffoonish and egotistical princes who perform the hilarious duet ‘Agony’ which proved to be a highlight. The stylish visuals are plentiful with director Rob Marshall at the helm. The epic sweeping camera shots and the luscious pallet of colours layer every scene with visual splendor. The sensibility and musicality of the direction showcases the care that Marshall must have put into each and every scene and we feel the effort throughout every moment of this wonderfully arranged and finely executed piece. Unlike the many jukebox musical adaptions that have been forced down our throats (cough cough*Rock of Ages*cough cough) this is not full of the ‘classic’ tunes of yesteryear that fail to have an unfamiliar audience ‘dancing in the isles’. What it does have is a beautifully constructed score, wickedly funny lyrics and a well paced, poignant and elegantly crafted story that will have toes tapping and smiles forming in cinemas all over the world!